A Bearizona wedding! Are you kidding me? That was the first thing that ran through my mind when Lisa and Juan mentioned their wedding venue. Umm, yes!! One thing I love about wedding photography, is when my couples have a unique fun venue. Bearizona Wildlife Park certainly fits the bill. Located in Williams Arizona, it is home to several animals, including bears (naturally). I was doing cartwheels inside my head when I learned this would be their venue. My wife and I have taken our kids there while camping in the high country but I never dreamed I would photograph a wedding at the park. Score!!! Upon arriving into Williams, I met Lisa at her mother’s house as she was finishing up her makeup. A few detail shots of her dress and then it was time to put it on. With supporting help from her mother and grandmother tying up the back of her dress, Lisa was ready for the day! These getting ready shots are always so much fun as both mother and bride share that special moment. Lisa finished up with getting her wedding shoes, I mean cowgirl boots on. This is northern AZ, it’s boots or nothing. Juan was in his final stages of getting ready at a nearby hotel. Donning some kick but jeans and a black cowboy hat, Juan was ready for business. My 2nd photographer took the fellas over to a nearby meadow for some groom/groomsmen pictures. These guys looked awesome! Lisa looked stunning as she made her way in for the ceremony. With friends and family in the crowd, Lisa and Juan became William’s newest married couple. We wrapped up the bridal party photos and moved on to formals of the bride and groom. With a vintage American LaFrance firetruck at our disposal, we made our way to the outskirts of Williams to photograph the newly weds. What more could you ask for? 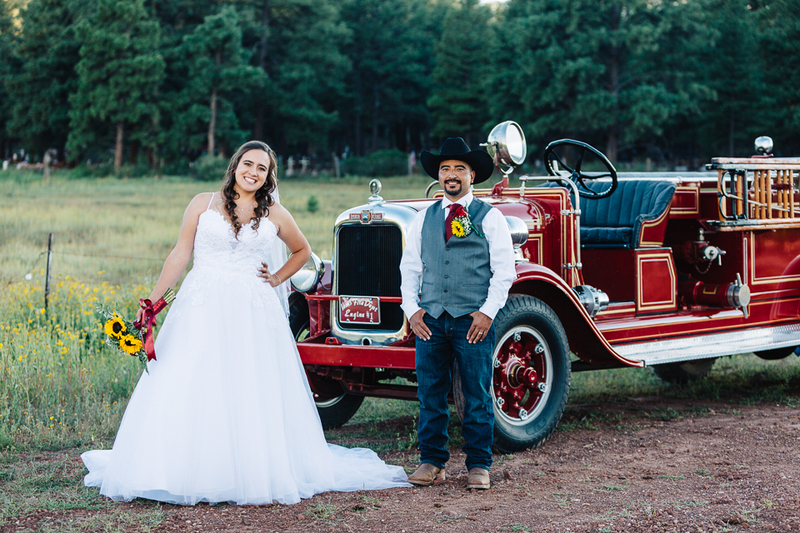 A beautiful couple, a classic firetruck, and the scenic landscape of northern Arizona made for some incredible photos. As sunset approached we finished up and returned to the venue for the grand entrance. Lisa and Juan were introduced and had their first dance as husband and wife. The night continued on with dinner and dancing. 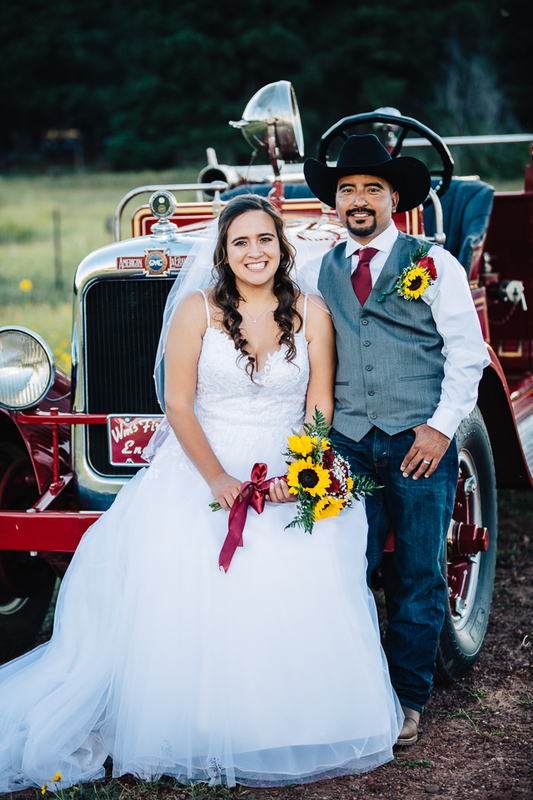 Lisa and Juan have been long term employees of the park, so it was only fitting they should have a Bearizona wedding. It was such a special treat to capture their big day. Below are a few of my favorite images from Lisa and Juan’s wedding. Big thanks to my 2nd photographer, Matt Beutel for assisting me on the day. I couldn’t have done without him. No wedding happens on its own and these people were behind the scenes making sure it went off without a hitch.